the most enjoyable commute to work you’ll ever have; a ski down the mountain in the freshly groomed snow! 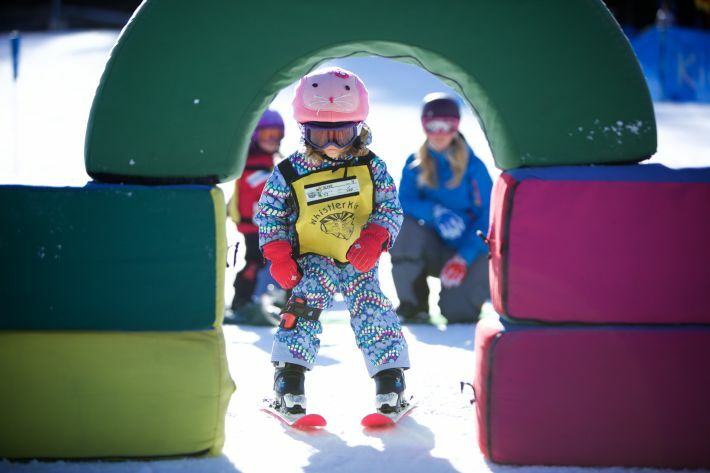 Former Oyster Whistler Kids ski instructor Lucy spent 5 months teaching children to ski as part of her gap year. 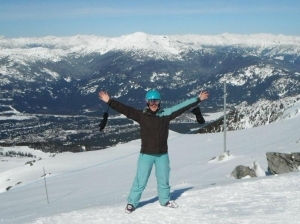 We asked Lucy to describe her typical day working at Whistler Kids as a ski instructor. “Where to start? No two days are the same at Whistler Kids! What I’ve tried to do here is to describe a typical day as a ski instructor. My job involved coaching (and looking after!) the “minis” (3 and 4 year olds). The day starts early for a ski instructor, you may be in a ski resort but this is definitely not a holiday. 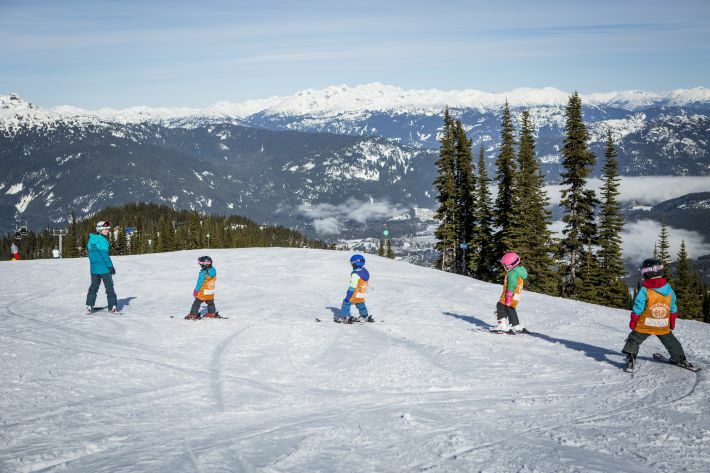 Whistler Kids operates across three locations within the resort of Whistler Blackcomb and Oyster participants are split across all three (Whistler Village, Blackcomb Base and Creekside). I was working out of the Whistler Village base and for me work began each day at 8.15am which means leaving staff housing for the most enjoyable commute to work you’ll ever have; a ski down the mountain in the freshly groomed snow! Upon arriving at the Whistler Kids centre you’ll have a meeting with your supervisor to learn about the plan for the day, then you will take your place on the bench, armed with name tags and GPS trackers, waiting to be assigned your class. Expect to have at least one crier (they are only 3 or 4 years old so we’ll let them off, plus they look incredibly cute in their all-in-one ski suits!). Lessons aim to start at 9am and since the children’s ski area is half way up the mountain the first challenge is encouraging/herding the children onto the cable car for the 10 minute ride. Yes it moves, and yes we’re getting on it. I never thought I would be starting my day by singing songs and playing games to keep the children entertained on a lift! Depending on the ability of the children, my days were mostly spent on the magic carpet (sadly it doesn’t actually fly) teaching the most important part of skiing; how to stop. Most children will not accomplish this very quickly and I spent a lot of time chasing after children before they crashed into the trees, fences or foam blocks. On the odd occasion I’d get a higher ability class and we’d spend the day exploring the mountain and trees, armed with plenty of cookies of course. Hot lunch is provided for free at around midday (depending on the age of the class) so eat as much as you can! The skiing is interspersed with games, story time, hot chocolate and a play in the jungle gym (even more so when the weather was at its coldest). Finally we’d all head back down on the cable car to mum and dad at 3.30pm, and the children were returned to their rightful owners. Once the children had been handed back, I would clear up my assigned area and be heading home by 4pm. This involved a short cable car ride back up to mid station on Blackcomb Mountain followed by a 50 metre ski to the entrance to our accommodation. During the last few weeks of the season when the lifts are open later, if all your children were picked up on time you might be able to squeeze in one last run before heading home and crashing out on the sofa. For most of the season, the lifts close at 3.30pm meaning no time to ski after work. When then clocks change, the lifts stay open until 4pm, giving just enough time to get to the top of Whistler and enjoy a ski down – good to blow away the cob webs after a challenging day at work! Thanks very much Lucy, we are all so pleased that your memories of Whistler are still so strong. If you want to get involved and follow in Lucy’s footsteps, check out our ski instructor in Whistler page for more information. Lucy went to Whistler with Oyster a few years ago now but her experience in Whistler has helped to shape her career. Today, Lucy is a qualified primary school teacher working at a school in London. Without doing the season with Oyster, she wouldn’t have gained the experience to realise that she enjoys working with children so much. Lucy’s story is just one of many where people have gained skills and experiences that have helped them in their careers later on in life. If you are considering a gap year, stop considering and just do it!